Four undertrials, including three accused in the Beant Singh assassination case, escaped from the high security Burail jail in Chandigarh on Thursday, jail sources said. 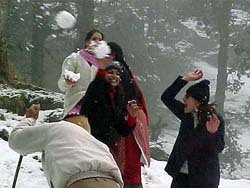 The cold wave sweeping across the northern region tightened its grip as Himachal Pradesh and Jammu and Kashmir received fresh snowfall today. Will the Russian aircraft carrier Gorshkov be really useful to the Indian Navy? 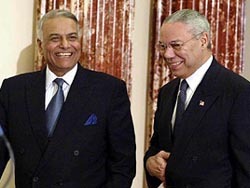 There is no US role in “terms of mediation” between India and Pakistan, External Affairs Minister Yashwant Sinha said, contradicting Secretary of State Colin Powell’s recent remarks that the breakthrough in Islamabad was the result of Washington’s two years of efforts. Prime Minister Atal Bihari Vajpayee today asked the BJP to gear itself for the Lok Sabha elections and wanted the Chief Ministers of BJP-ruled states to focus on accelerating developmental activities. Just as the crisis in the Kerala Congress was nearing resolution, the “peace process” was effectively derailed last night with veteran leader K.Karunakaran leaving Delhi in a huff today without meeting party president Sonia Gandhi. Publicly admitting what has, so far, been left unsaid, the Congress today maintained that party President Sonia Gandhi’s two children have been in the party since their birth. The Hurriyat Conference will hold crucial talks with Deputy Prime Minister L.K. Advani tomorrow to discuss ways of finding a lasting solution to the vexed Kashmir issue. In a departure from the convention, the government today appointed the Union Home Secretary, Mr N. Gopalaswami, as the Election Commissioner. Pakistan is under renewed pressure from the United States of America to divulge the exact details that may have emerged following the interrogation of its six nuclear scientists who were detained by the Pakistani authorities following disclosures that Islamabad had proliferated nuclear technology. Almost 30 years after his conviction for murder, Malkiat Singh Bhandol, who had since acquired Canadian citizenship, was arrested by the Royal Canadian Mounted Police (RCMP) in the Canadian province of British Columbia and would now be deported back to India.